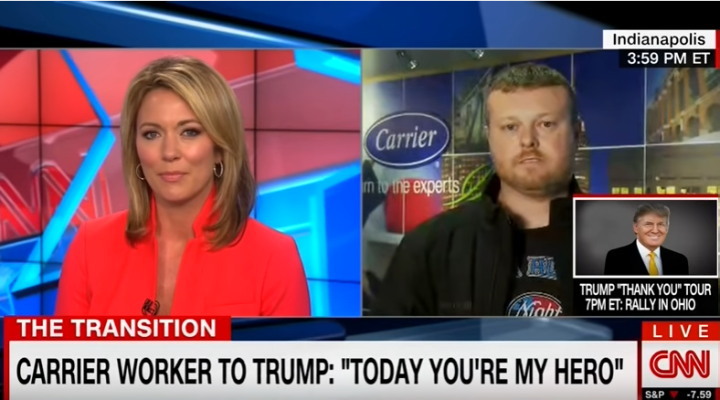 During his speech at Carrier on Thursday, Donald Trump referred to a Carrier employee he saw on the news who believed in Trump’s promise to save their jobs. Trump asked if he was in the audience and his mother spoke up, getting praise from Trump for raising her son well. CNN tracked down the employee, Will Cornett and spoke to him. In his CNN interview, Cornett told host Brooke Baldwin that he had no idea Trump would be talking about him in his speech. “So you believed Mr. Trump when he made his promise?” Baldwin asked. Cornett said he did not meet Trump at the announcement on Thursday but would thank the president-elect for the Carrier deal if given the chance. “I would just say thank you for keeping your promise and that I believe in you and today you’re my hero,” Cornett told Baldwin. Baldwin also asked Cornett what he would say to other employees who are fearful and anxious that their own jobs may be outsourced. “I’d tell them not to doubt the Donald. He did it once, he can probably do it again,” Cornett said. Ignore everything Democrats are saying about the Carrier deal. This was a massive early victory for Trump and nothing his critics say can change that.